Local Environmental Centres Wales is the UK's first national network of Local Records Centres, delivering high quality biodiversity information and supporting wildlife recorders and environmental professionals across Wales. 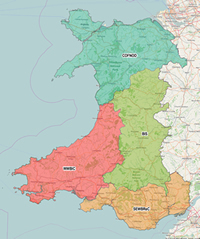 The wide range of products and servies offered by Local Records Centres Wales allows easy access to the most comprehensive, and up-to-date and accurate resource of wildlife data in Wales. As well as providing standardised information products, we can also develop customised use of the data, using our extensive data management and analysis expertise. Aderyn is just one of those products. Ensure that biodiversity information is fed into the decision-making process at an appropriate stage. Provide efficient, high quality information services to a range of users from public bodies to commercial consultants. Pro-actively encourage the recording and sharing of biological data and engage in initiatives to develop biological recording skills. Improve data flows by implementing and promoting simple and efficient systems for record submission, validation and verification. Improve links with the National Biodiversity Network (NBN), including greater data sharing with the NBN Gateway. Share best practice and expertise, particularly in the fields of management and technology. Ensure compatibility of data management systems and work towards the provision of Wales-wide data services. Ensure adequate representation on relevant decision-making bodies. Ensure regular communications across Wales between LERC staff and directors. Ensure that the role of managing and disseminating biodiversity information across Wales is valued and sustained through local and national partnerships. Achieve commitment to stable and secure funding for LERCs from every Local Planning Authority in Wales. Achieve commitment to stable and secure funding from all other relevant public bodies and NGOs. Recognise the value of working together, whilst embracing the local distinctiveness of LERCs. More information can be found at LERC Wales.